Some of the exoplanets that we’ve observed have eccentric orbits, or their orbits are inclined to their circumstellar disk. So how did these planets end up in these excited orbits? After all, planets form from the material in the circumstellar disk, so what pushes the planet into a non-circular orbit that’s misaligned with the disk? Astronomers have attacked this problem with a variety of hypotheses and models. One possible mechanism is a stellar flyby: another star moves close to the system, and scatters any planets into new orbits. This seems like a pretty reasonable possibility. After all, most stars form in clusters before drifting apart after the first few million years. That gives the stars plenty of opportunities for disruptive close encounters. And models of the effects of stellar flybys on planets have shown that the visiting star can excite a planet’s orbit. But stars that are still in clusters are at the right age to still have young, gaseous circumstellar disks. The gas in these disks has enough mass to affect a planet’s orbit. Models of planets in gas disks tend to show the gas damping an excited planet’s orbit into a more aligned, circular orbit. To use a terrible analogy, the visiting star is the life of the party, scattering the planet into a wild new orbit, while the gas in the disk is a buzzkill, calming the planet back down into a boring old aligned orbit. Fig. 1: Diagram of the geometry of one of the stellar flyby models. The red and green disk at center harbors a planet. 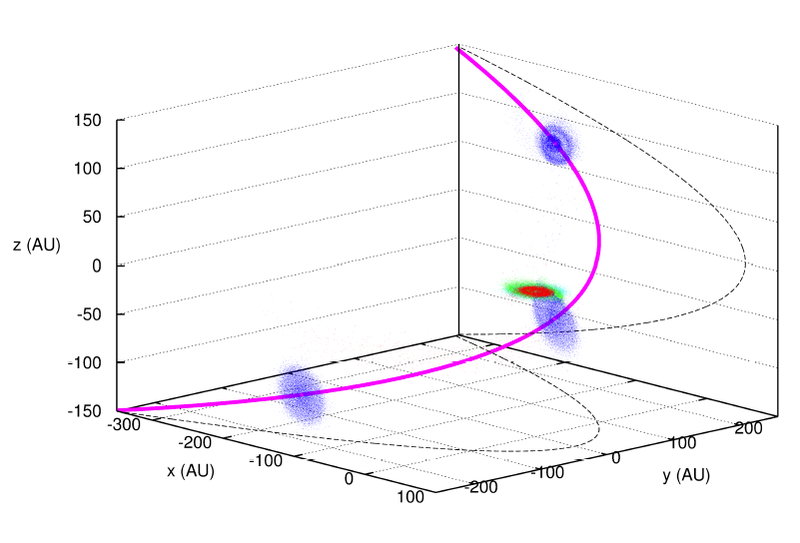 The other star passes by on a hyperbolic orbit (purple line). You can see the orientation of the second star’s disk at three different times along the trajectory in blue. But which mechanism is stronger and faster? Is the stellar flyby enough to put a planet on an excited orbit and keep it there, or is that effect always cancelled by the gas disk? The authors of this paper decided to investigate this question by modeling two interacting stars, each with a circumstellar disk. One of the stars also harbors a giant planet. Fig. 1 shows the geometry of the stellar flyby for one of the models in the paper. The system at the origin harbors the planet, while the planet-less system passes by on a hyperbolic trajectory. The authors tested several different geometries with different disk inclinations and closest approach distances for the two stars. They simulated each system with a smooth particle hydrodynamics (SPH) model called VINE (see Fig. 2). SPH codes model the way fluids behave and are great for simulating gas disks. After the flyby, the authors let the planet-and-disk system evolve a bit longer to see how the gas affected the planet’s new orbit. In each simulation, they found that the gas disk damped the planet’s excited eccentricity and inclination very quickly (within about 10,000 years, which is quick in astronomical terms), and the planet returned to a near-circular orbit aligned with the disk (see Fig. 3 for the data). In some cases, the disk had been excited to a new inclination, but the planet still ended up with the same inclination as the disk. What does this mean for stellar flybys? This paper and other work have shown that stellar flybys can definitely excite planets into eccentric and inclined orbits. But now the authors have demonstrated that if there’s still a gas disk present in the system, that excited orbit won’t last long. It looks like we’ll need to turn to other mechanisms (like scattering between planets) to explain why we observe eccentric and inclined exoplanet orbits! Fig. 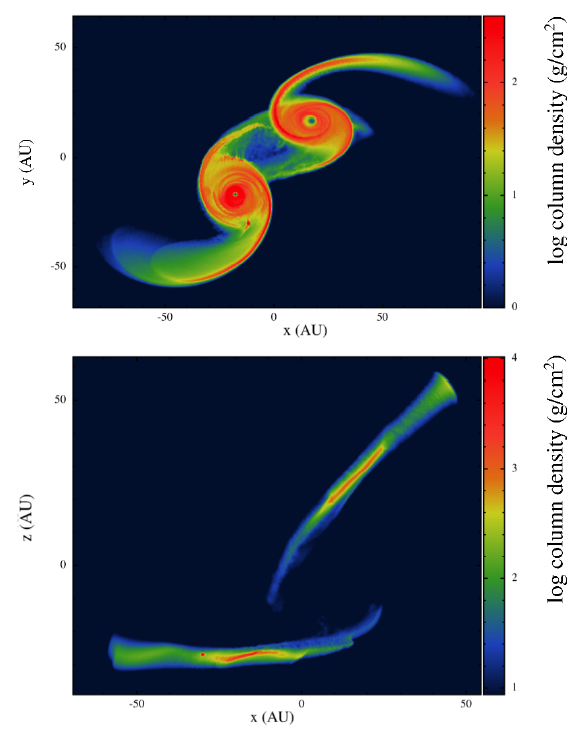 2: Density maps of the two disks interacting during the flyby. Fig. 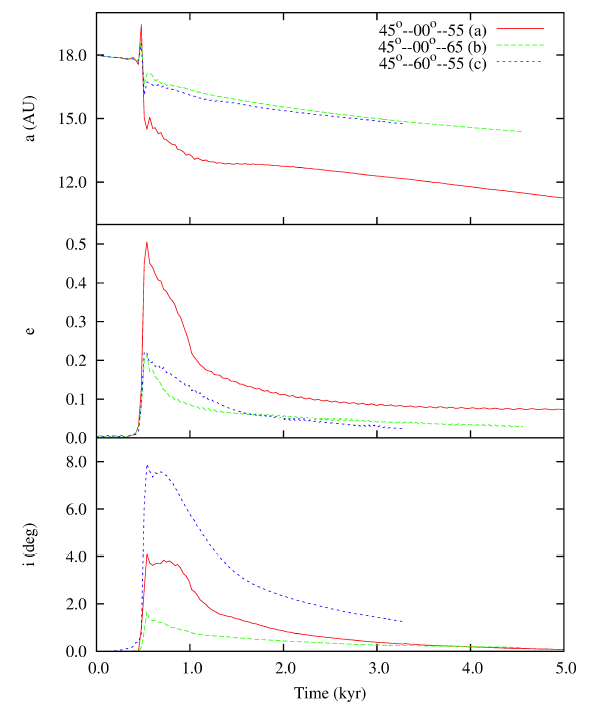 3: Time evolution of the semi-major axis, eccentricity, and inclination of the planet for three different simulations. The eccentricity and inclination jumps up during the flyby, but is then damped down by the disk over the next few kiloyears.